Home » Sight-seeing » Disneyland Paris! Today’s Paris memories center on Disneyland Paris. It’s smaller than Disneyland (and much smaller than Disney World), but the rides are much better (Indiana Jones is a coaster with a loop; Space Mountain also has loops and blows away the CA version) and the park is much more do-able in a day. 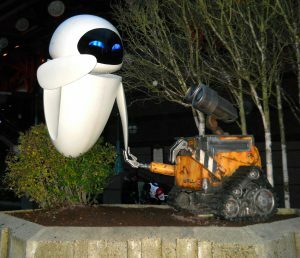 Plus: WALL*E and French food! And best of all, it’s very easy to reach from Paris (the park is in the suburb Marne-la-Vallee). Simply hop on the Metro to any of these stations: Charles de Gaulle Etoile, Auber, Chatelet Les Halles, Gare de Lyon or Nation. At any of these stations, you’ll need to switch to the RER regional trains (and buy a separate ticket for it, since Paris Metro passes/tickets don’t cover suburban trains). Hop on the RER A train to Marne-la-Vallee — the signs for this train also are conveniently marked Parcs Disneyland. 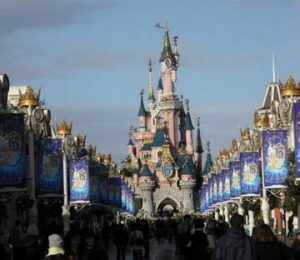 The last stop is just outside Disneyland in what is essentially the Paris version of Downtown Disney. This entry was posted in Sight-seeing and tagged Disneyland Paris, sight-seeing by Bob Adams. Bookmark the permalink.